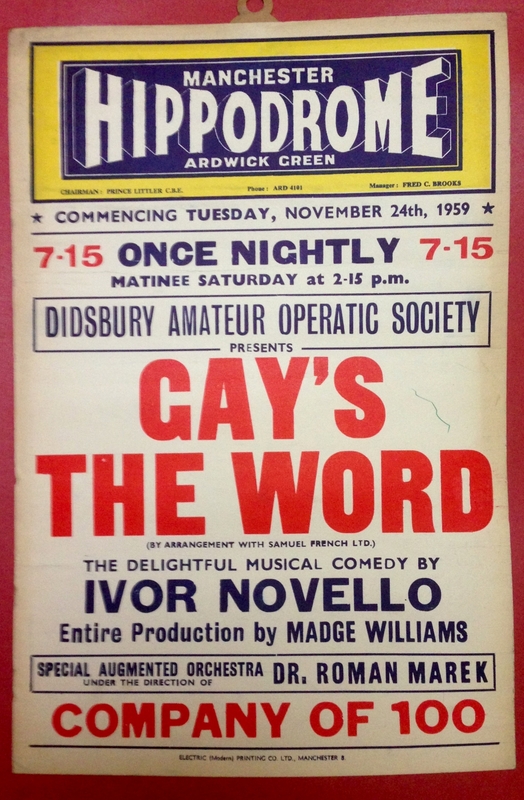 A wonderful playbill taken from the collection at Manchester Libraries, Information and Archives. This was on display as part of the Life's a Drag exhibition led by artist Jez Dolan. According to manchesterhistory.net, in 1935 the Hippodrome Theatre in Oxford Street in Manchester was demolished, to make way for the construction of the Art Deco Gaumont Cinema. At the same time the Ardwick Empire was refurbished and renamed the New Manchester Hippodrome. Odd to think of this splendid building so close to the Apollo, now vanished. Ivor Novello famously met Noel Coward for the first time outside the Midland Hotel in Manchester in 1917. Coward six years Novello’s junior.